I had read that tables here are among the hardest in Britain’s capital to secure! For those who are not familiar with the Ledbury, it is one of the top restaurants in the United Kingdom. The chef, Brett Graham, is an Australian and opened this eatery in 2005 in west London when he was only 25 years old. 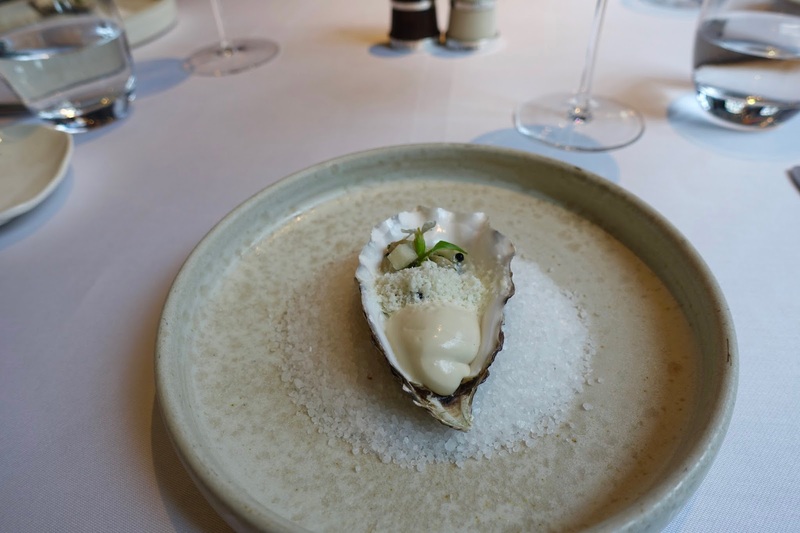 The Ledbury has been voted the UK’s best restaurant several times, it holds 2 Michelin stars and has been featured in San Pellegrino World’s 50 Best Restaurants (now it is on position 27). In my humble opinion, the third star with Michelin is only a question of time. 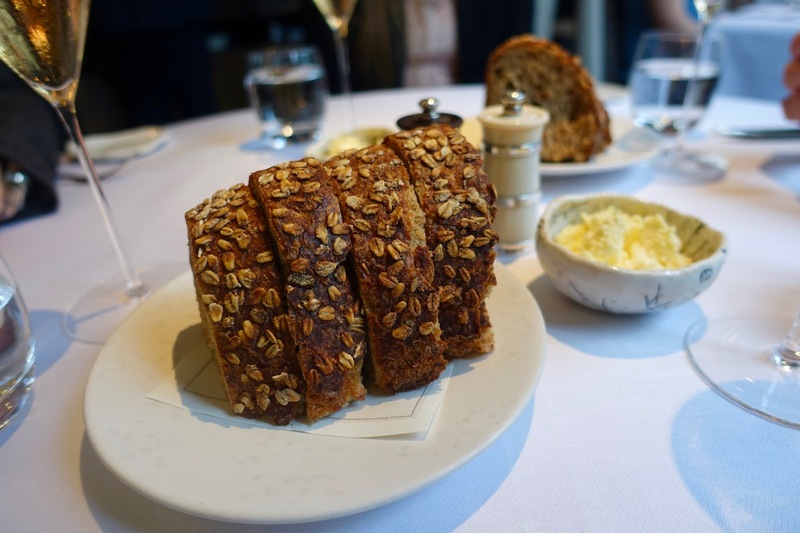 The Ledbury is located on the edge of Notting Hill. What began as a neighborhood restaurant is now a destination restaurant. 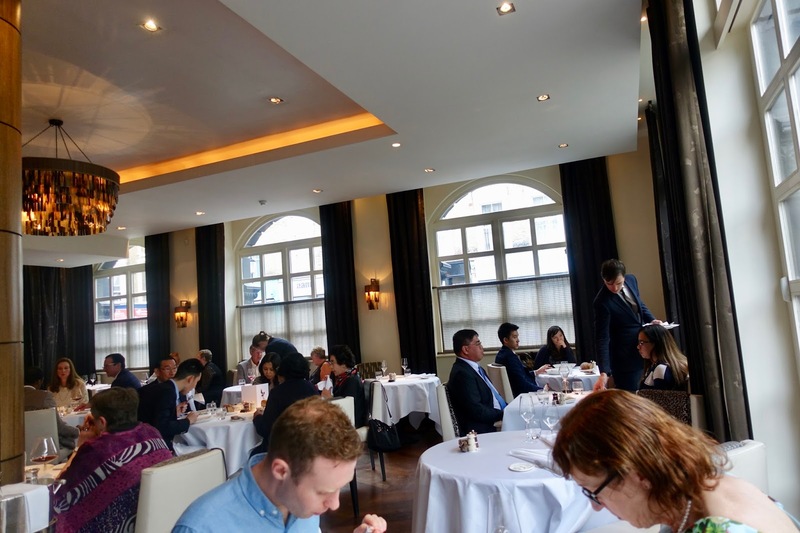 When we arrived at the Ledbury on a Sunday night, it was packed to the last seat. We got a very warm welcome and were lead to our table, which was the one of the last not been occupied yet. The eatery is contemporary styled and mid-sized (55 seats). There is also a small outdoor area, which was not in use on the occasion of our visit. Almost instantly, I felt at ease, what is rarely the case in such places. The ambiance was somehow laid-back although being in one of London’s most feted restaurants. As we had booked the restaurant for a special occasion, we found an anniversary card on the table, a nice touch! As just mentioned before, you feel comfortable in the casual elegant dining room, and this is mainly thanks to the staff’s attitude. Instead of being pompous or arrogant as it is still the case in places like these now and then, the employees are unpretentious yet relaxed. Service was immaculate from the very first minute to the last one. There is not the smallest thing that gave reason to complaints. Darren McHugh, the general manager, who oversees the service and escorted us through the culinary journey, deserves a special mention. He explained all the courses to us, informative yet entertaining in his distinctive way. We were deeply impressed by the flawless service we met here, which was by the way also extremely well paced! When it comes to prices, this is of course not the place to make a bargain! However, I found the meal fairly priced given the elaborate cuisine, the immaculate service and last but not least the restaurant’s reputation. While there is only the tasting menu available on Friday to Sunday (6 courses £ 125, 8 courses £ 145), it is possible to put together a 4-course menu for £ 120 out of an array of dishes at your disposal the rest of the week. Also there are enough reasonably priced wines available, which is often not the case in other acclaimed restaurants. All in all, prices are okay for this level of quality. Brett Graham’s cuisine has clearly roots in the classic French one. 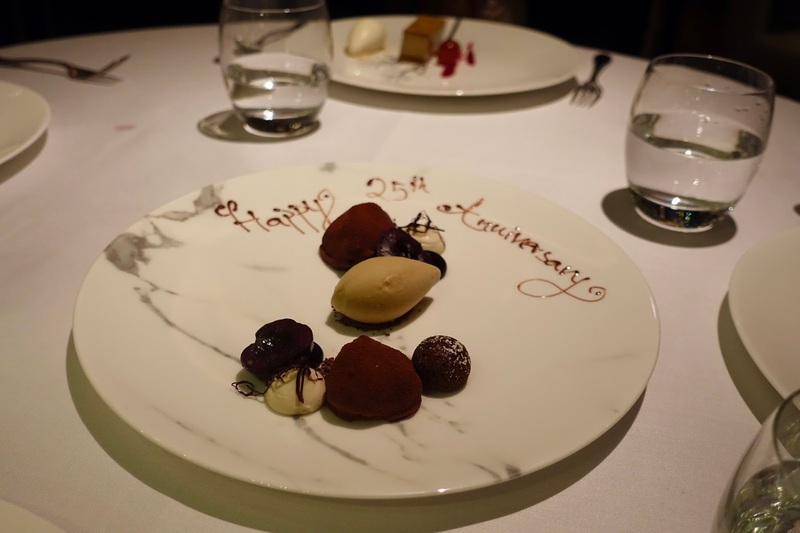 During more than ten years at the Ledbury he developed it to a modern British cuisine. 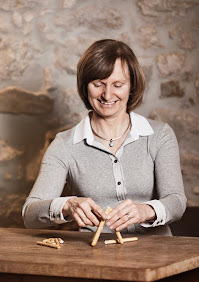 It is based around fabulous local products whenever possible, often wild English game. I hear that the chef has just opened a deer park to supply the restaurant with venison. 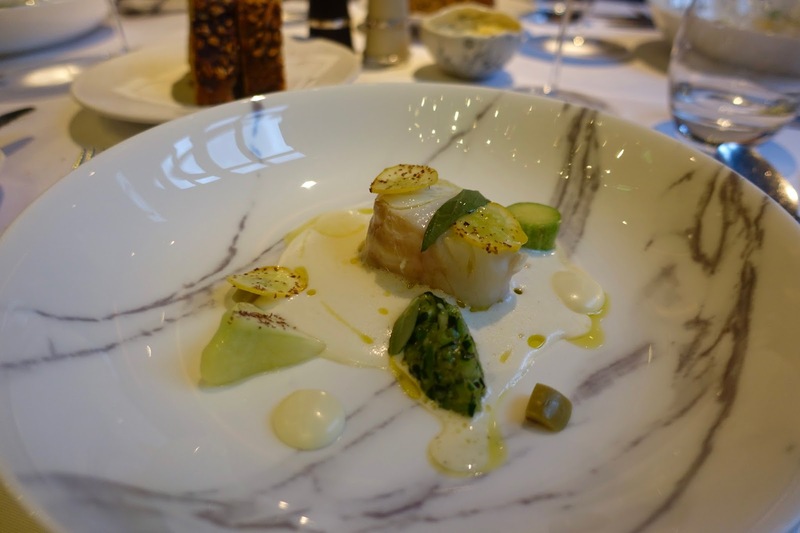 What I especially liked is that the chef does not use too many different ingredients but focuses mainly on a solitary ingredient in order to push it as far as possible. In addition, the portions are big enough that you can really savor the dish. He also leaves away unnecessary show or artwork on the plates, but concentrates on the essentials. The three different canapes kicked off a memorable culinary journey. 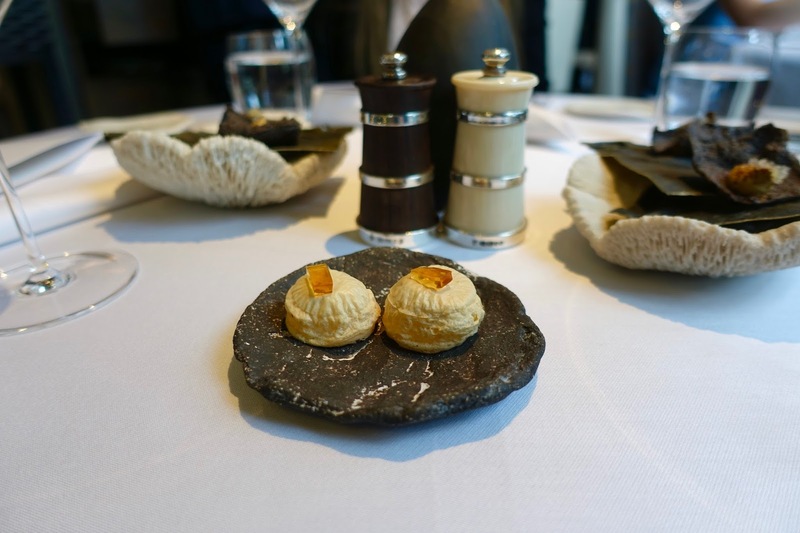 First, a puff filled with guinea fowl pate and topped with a small cube of jelly was served. The latter was an ideal sweet-sour contrast to the rich filling. A seaweed cracker paired with a delicious cream followed. Finally, a venison dumpling with fruit jelly on top was brought to our table. The meaty filling perfectly harmonized with the sweet-sour topping. The first official course was a taste sensation because the cold fish was combined with a frozen garnish. Both elements balanced each other out just great so that a delicious pairing resulted out of them. 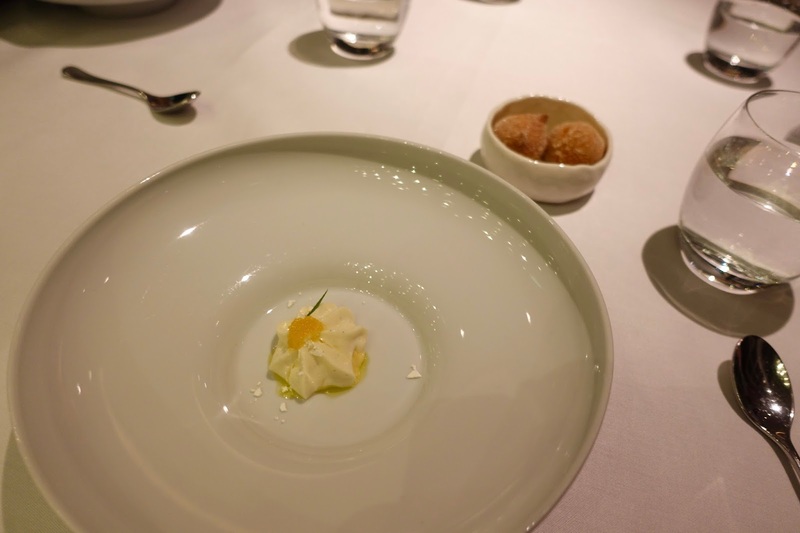 This was the moment when bread was served together with goat butter. Freshly baked sourdough bread in slices were put on the table. It was fabulous and I had to be careful not to eat too much of it. This was a difficult thing to do because it was simply too good! The next dish was a delicious combination of sweet, earthy, salty and smoky. The oiliness of the eel went well together with the wafer-thin slices of red beetroot and due to having been baked in clay the flavor was even more intensive. 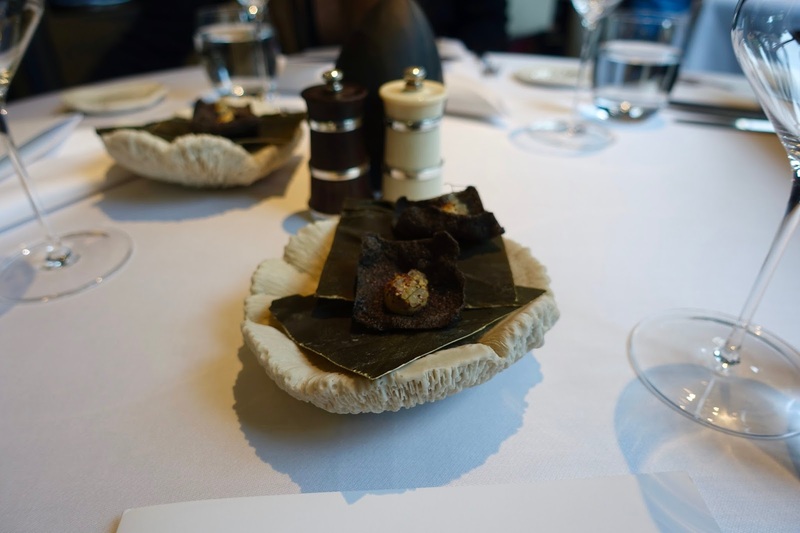 We followed with my absolute highlight of the meal, a pheasant’s egg, served warm with celeriac and dried ham, finished with shavings of truffle and accompanied by a reduction of Arbois wine. These ingredients in unison made a heavenly combination, even more so when the egg yolk popped and spread to blend with the rest of the elements. 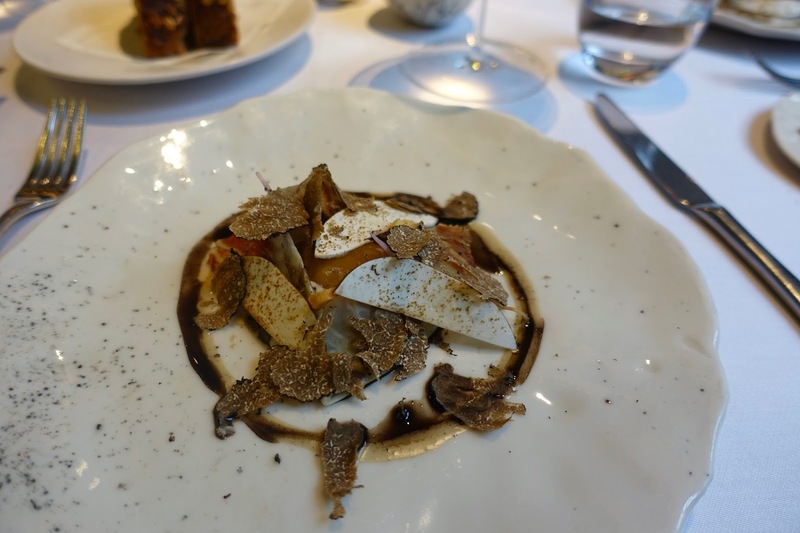 And the best thing, we were not overwhelmed by the substantial amount of truffle in the dish as it is often the case when you find truffle on the plate. Even my husband who is no a truffle enthusiast enjoyed the course very much! The gastronomic pleasure found its continuation in a seafood course. The solitary scallop had no resemblance with others I had sampled. It was large, soft and almost fell apart. Apart from the special texture the taste was superb and together with fennel and elderflower wine this seafood course blended magnificently. The last starter raised laughs at our table because we expected to be served poultry. However, hen of the woods turned out to be a mushroom, a type that is intensely flavored and has a delicate & feathery texture. Together with an earthy emulsion, enhanced with the lemon-pine flavor of rosemary, this was a new and pleasant taste sensation. In contrast to the menu featured outside the restaurant the main course comprised not aged pigeon but duck. As the chef is said to be an avid shooter of game, I suppose that it was a game bird. In any case, it had an immensely delicate flavor and was immaculately cooked to perfection. Its lovely flavor was accentuated by all the garnishes on the plate, the sweet-sourness of the cherries and the bitterness of the red leaves. 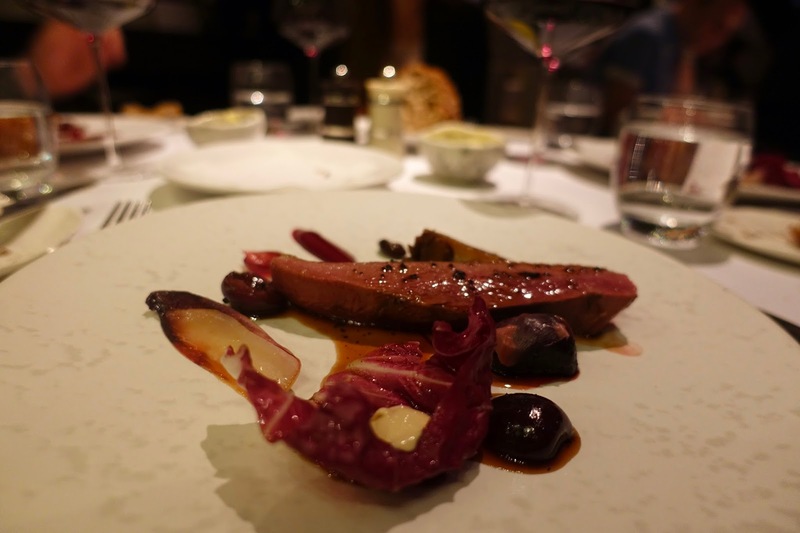 It was easily the most scrumptious duck I have ever tasted, a great course indeed! Time had already come for desserts! The first one was a passion fruit curd where the chef proved again his expertise. Passion fruit as element in a dish often overpowers it with its fruity-sweet tartness, but not here! The curd was subtle with just the right balance between sweetness and sourness. It was paired with two small donuts which were an ideal complement. The main dessert was an outstanding custard tart with a crisp sheet of pastry on top. Its flavor was unbelievably sublime and its consistency just right, we relished it! The ginger ice cream with its distinctive flavor was the perfect match to the rich, silky custard. I can understand why this dish is one of the chef’s signature desserts! Since it was our wedding anniversary, they brought us an extra-dessert for sharing amongst the four of us. It was a delice of chocolate. Worth mentioning is certainly the guinness ice cream, which balanced out the richness of chocolate. This was a great way to end a truly memorable dinner! 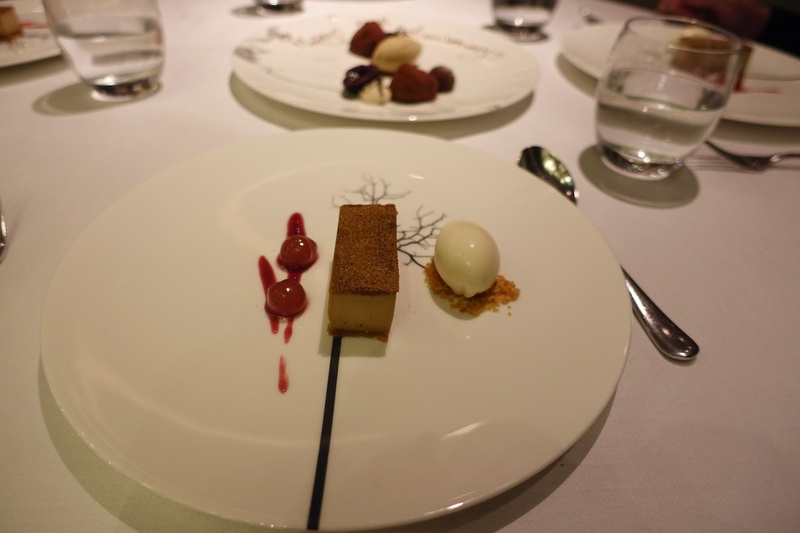 The culinary experience at the Ledbury has in any case to be classified as one of the best meals I have ever had. 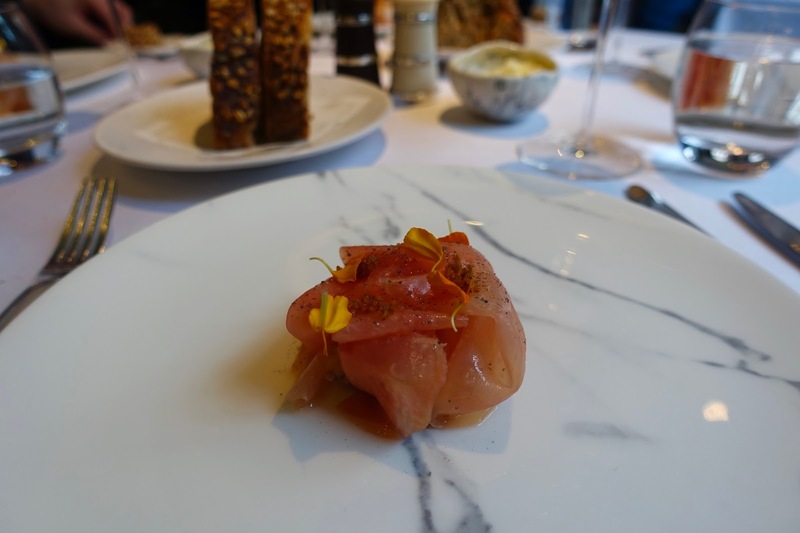 The restaurant, run by Australian chef Brett Graham, is one of London’s hottest fine dining venues and one of the toughest reservations to get in Britain’s capital. 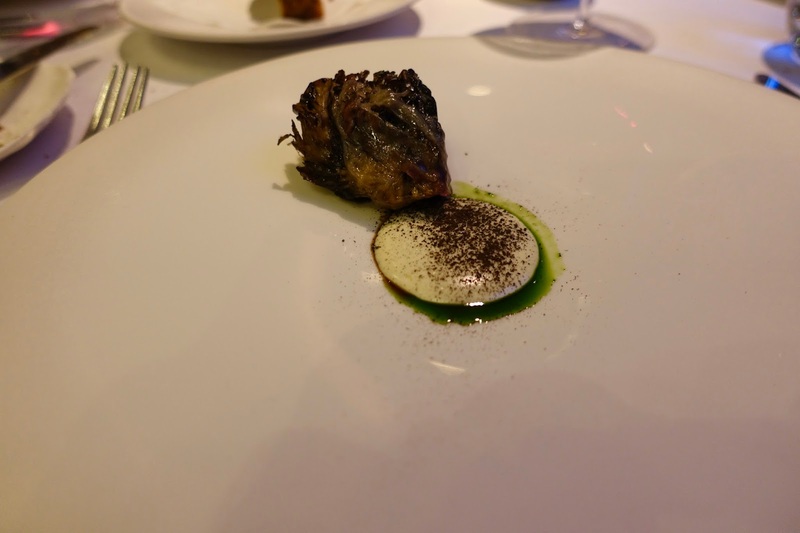 The chef knows how to create flavor compositions that linger long in the memory; I vividly remember the warm pheasant’s egg combined with celeriac, dried ham, arbois and truffle, an unbelievably interesting flavor sensation! 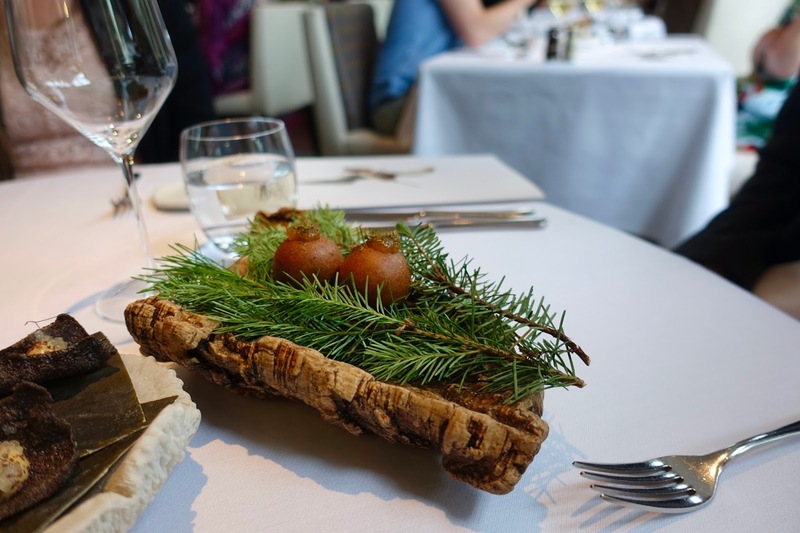 A special credit deserves the fact that the chef uses British products whenever possible, especially deer and sometimes even hunted by Brett Graham himself. The service under the aegis of Darren McHugh cannot be praised highly enough. He and his team are able to create a relaxed and unpretentious atmosphere where diners feel at ease. The staff made it possible that my family and I could enjoy our fabulous gastronomical journey to the fullest!